Love breakfast cereal but not the price of boxed cereal? This healthy homemade granola recipe with persimmons and maple syrup offers great fall flavor in your cereal bowl. It’s inexpensive and tasty! Persimmons are one of those love ’em or hate ’em fruits. My Grandpa Sam? He loved them. 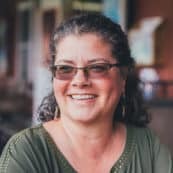 Loved ’em. His beloved persimmon tree hung with orange orbs long after the leaves fell off in the autumn, and he’d happily sit with a persimmon and his pocket knife, enjoying one of his favorite fruits. Me? I keep trying fresh persimmons but I can’t get over the wooly tongue feeling that comes from eating them. I do, however, like them added to different recipes. They have a rich flavor that evokes autumn for me. Thus, this healthy homemade granola! When a friend recently invited me to pick persimmons from an old Fuyu persimmon tree, I couldn’t resist. Our empty granola container coupled with 40 pounds of fast-ripening persimmons inspired me to experiment with homemade persimmon granola. Turns out, this persimmon recipe is a winner! Look around your neighborhood to see if there are persimmons that can be salvaged; no sense letting them go to waste. Don’t have persimmons? Try this pumpkin maple granola instead! This recipe couldn’t be easier. It starts with whole grains, and is flavored with spices, maple syrup, and of course, persimmons. It really is that easy. 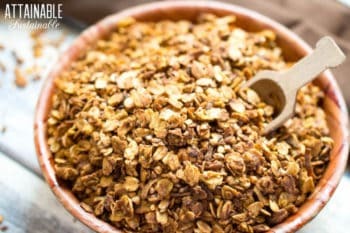 Combine all of the ingredients in a large roasting pan so you’ll have plenty of room to stir this healthy homemade granola without spilling it all over the inside of the oven. 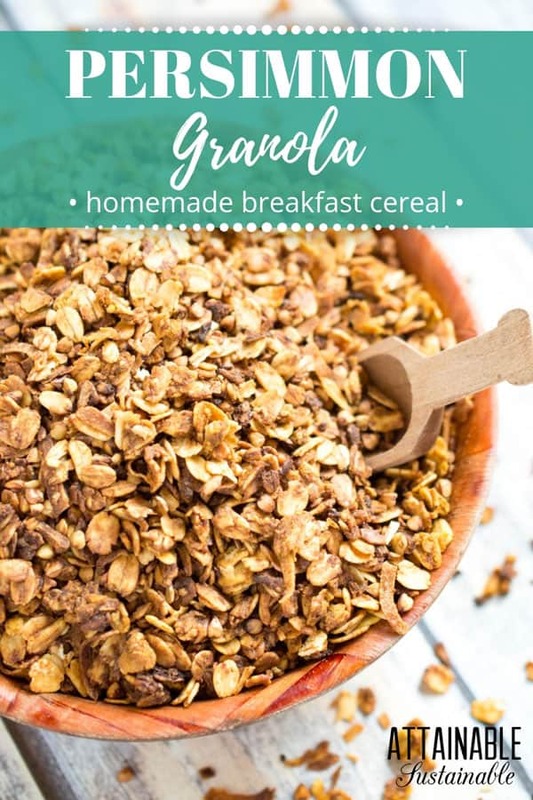 This healthy homemade granola is an easy breakfast food to make at home, plus it will save you bundles of cash. Persimmons give this granola a rich flavor. Combine all ingredients together in a large roasting pan. Stir until thoroughly combined and the nuts and oats are well-coated. Bake at 350 degrees (F), stirring every 10-15 minutes for about an hour or until the granola is toasty brown. Turn off the oven and allow the granola to remain in the oven until it cools. Store in an airtight container. 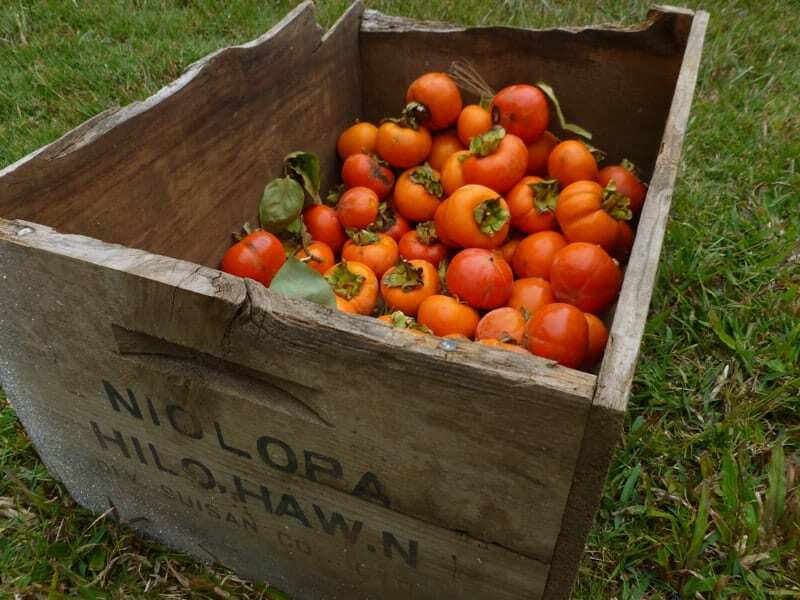 To make persimmon pulp: Choose very ripe fuyu persimmons or a custard-like American persimmon. Slice the stem from the top of each persimmon and use a spoon to scoop pulp into the bowl of a food processor fitted with a plastic blade. Pulse until the persimmon flesh is a fairly smooth consistency. I opted to do this with the seeds intact, then I picked the seeds out of the pulp. I found this easier to do than removing seeds before processing. Don't have a processor to make persimmon puree? No worries. 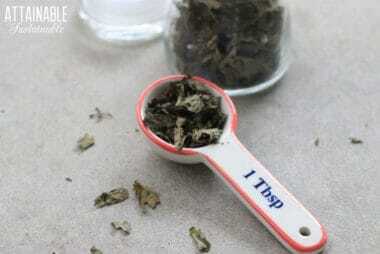 Just use a bowl and a potato masher. No persimmons? You can substitute pumpkin puree! Store this healthy granola in an airtight container for up to a month. I love persimmons but know what you mean by wooly tongue. I didn’t know until I moved away from the Forestville ranch that there were different varieties of persimmons. The ones we grew had to be very ripe or they were definitely “wooly tongue.” My Korean neighbor in So. CA introduced to a variety she bought at the farmers market that were delicious eaten hard and green. Now I am here in Kapaau, I am having to learn not only what grows but what varieties. You’re here?! Terrific! Let me know if you’re ever up Honoka‘a way. ive eaten several fuyu persimmons, how is it that ive never found any seeds? or have i just gotten lucky every single time? 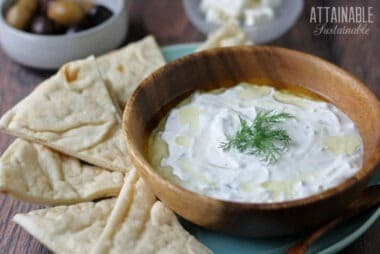 Super quick and easy, plus tasty!